At 7 years old, Kansas Middletent and his twin brother violently brawled as entertainment for their drug-addict father and his friends. They were at a party in their home on a Native American reservation. Wednesday, Middletent spoke at “Movies that Matter: Native America — The Untold Story and short film Legacy,” a film screening and discussion organized by Native Hope and hosted by Impact Hub Boston. Trisha Burke, executive director of Native Hope, said the nonprofit aims to share positive stories and unheard voices coming out of reservations despite disparities that have come to dominate the stereotypes of Native American life. 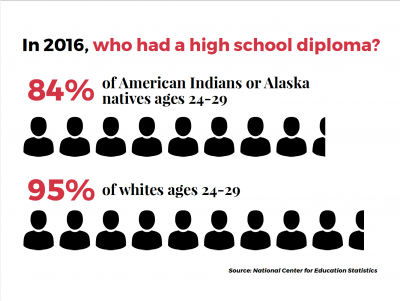 About 84 percent of American Indians or Alaska Natives ages 24 to 29 had high school diplomas or their equivalent in 2016, according to a study by the National Center for Education Statistics. In the same study, 95 percent of whites had high school diplomas. Middletent spoke about his personal experience with education. Despite graduating as valedictorian of his class and receiving an athletic scholarship from Dakota Wesleyan University and being selected as a Gates Millennium Scholar, Middletent dropped out of college after his second year trying to balance his roles as a father and a student. Burke said interest in Native Hope and its message has surged in recent years, possibly because of new technology. 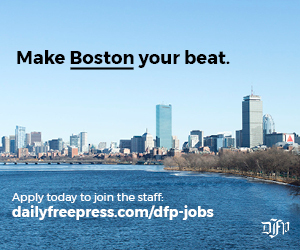 Raquel Halsey, interim executive director of The North American Indian Center of Boston, attended the event and said she feels a significant amount of people in the Boston community have shown interest in events centering around Native American culture. MMA fighter Nikki Lowe also spoke at the event. “Legacy,” a short documentary about Lowe’s life, created by filmmaker Mark Lewis, was played for attendees. “Legacy” documents Lowe’s childhood, many health problems, teen pregnancy, close relationship with her family, addiction to alcohol, path to sobriety and eventually her successful career as an MMA fighter. Following the documentary, Lowe spoke about how the hardships of reservation life negatively impact children. As a Native Hope fellow, Lowe receives funding from the nonprofit to travel and share her story. She said she hopes to encourage kids she speaks like she was while learning to fight.